Nav Coin is a type of decentralized cryptocurrency based on the most recent Bitcoin Core. Nav Coin has a solid foundation and supports easy-to-use wallets loaded with advanced features to protect privacy and SegWit functionality. With Nav Coin, users can opt for private transactions to protect their identity and data during online transactions. Nav Coin uses a Proof of Stake algorithm to process transactions and secure the network, therefore holders of the coin can stake their investment and receive 5% rewards of their balance per year for doing so. In this guide to Nav Coin we will take a look at the technical details, team, how to purchase and store Nav Coins to receive your staking rewards. Who Is the Nav Coin Team? 1 Who Is the Nav Coin Team? 2 What Makes Nav Coin Different? 3 How Is the Technology Behind Nav Coin Different from Other Shielded Cryptocurrencies? 8 How Does Nav Coin Keep Transactions Private? 9 What Projects Has Nav Coin Completed? 10 What Projects Are Planned for the Future? 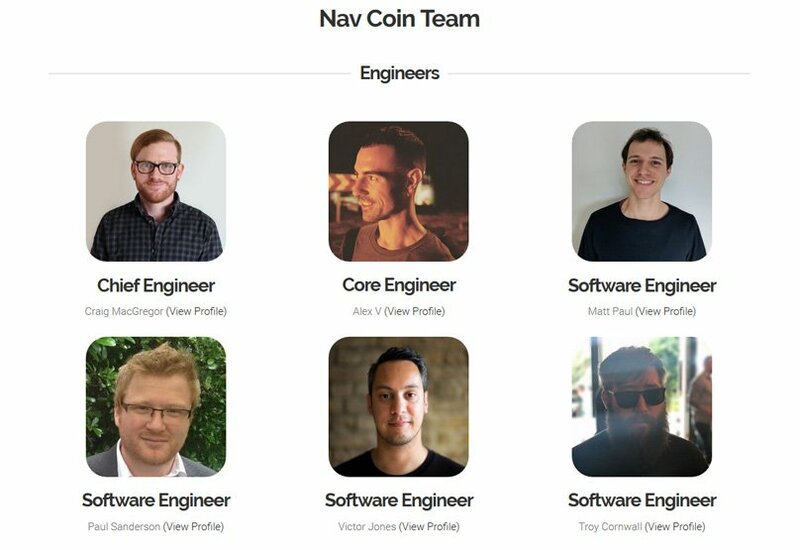 The Nav Coin Team is extensive. The engineers include chief engineer Craig MacGregor, core engineer Alex V, and software engineers Matt Paul, Paul Sanderson, Victor Jones, and Troy Cornwall. Community software engineers include Admir Sabanovic, Universal, and Ivan Muller. The digital strategy team includes marketing director Kieren Hyland, creative director Laura Harris, digital strategist Josh Drummond, operations manager Guy Sinclair, and advisor Melissa Davies. There are also six people on the legacy team. What Makes Nav Coin Different? Nav Coin has a few features that help set it apart from other cryptocurrencies. One is the significantly faster transaction time. Instead of having to wait 10 minutes, you can send NAV (the tokens) anywhere in the world instantly. The transaction will be confirmed and become spendable within just 30 seconds. Nav Coin also allows for Proof of Stake, letting users earn money while sleeping or doing something else. Just change the wallet to the mode for staking. Doing so will let you earn as much as 5 percent interest. This system is also eco-friendly since there is no need to get a server farm or expensive hardware for Proof of Stake mining. Because any computer can do it, this is not only better for the planet, but also makes it possible for all users, regardless of their resources. Another factor that sets Nav Coin apart from the others is its low transaction cost of just 0.0001 NAV. The development team is also active, providing weekly updates so there is no doubt as to what progress has been made. Such regular updates are very rare from other cryptocurrency projects. The Nav Coin system is regularly updated to include the latest version of Bitcoin. This means that users get all the benefits of Bitcoin but the option of privacy that is unique to Nav Coin. The community is also incredibly supportive and friendly, as well as active. In fact, it only took the community two weeks to vote on and then activate SegWit (Segregated Witness). How Is the Technology Behind Nav Coin Different from Other Shielded Cryptocurrencies? The vast majority of cryptocurrencies offering the same level of privacy as Nav Coin rely on either ZKSnarks or CryptoNote/RingCT. Unfortunately, both algorithms are fairly new with minimal studies. In addition to doubts from some academics about the algorithm validity, if they break, the transaction history becomes visible, eliminating privacy. To avoid these problems, Nav Coin relies on RSA, an algorithm that is widely studied and used. It also uses 2,048-bit-length keys, which are generally considered safe, but it can move to 4,096-bit length for additional safety without any negative effects. To get started using Nav Coin, the first thing you will need to do is create a wallet to store them. You have a few options for this, if you wish to stake your nav Coins and earn 5% rewards ( per year ) for doing so, you will need to download the Nav Coin core wallet. If you choose this option, you will need to download the entire blockchain before you can stake which is around 1.5GB. For staking, you will also need to have your wallet open on your computer and connected to the internet. If you do not wish to take part in Staking, you can download the Electrum wallet which uses remote blockchain data. There are also options for creating a paper wallet for cold storage and you can store Nav in the Coinomi Android wallet for mobile. 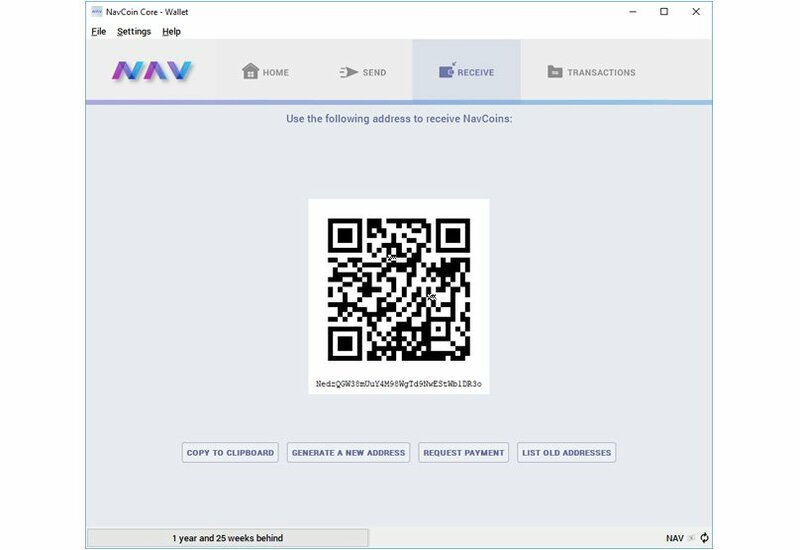 If you want to Stake your Nav Coins for the 5% rewards, go ahead and download the Coin Core wallet to your computer and run the program, choose your install location and then wait while the blockchain is downloaded. To send your coins to the wallet, click the “Receive” tab where you will be give your address along with it’s QR code. From here you can generate as many addresses as you like. Once thing you should do at this point is backup your wallet incase you have to restore it in future, visit the “File” menu and click “Backup Wallet” and a wallet.dat file will be generated for you. You should back this up somewhere safe, like a USB stick. Once the blockchain has downloaded and you have your Nav Coins in the wallet, you will be staking. For further information on Staking, check out this website which covers a lot of tutorials for Staking and how you can set up a Raspberry pi for staking. They also have a handy Nav Coin Staking calculator to work out your electricity costs and potential rewards. Now you have your wallet setup, you will want to purchase some Nav Coin to hold in it. You are not able to purchase NAV with “Fiat” currency so you will need to first purchase another currency – the easiest to buy are Bitcoin or Ethereum which you can do at Coinbase using a bank transfer or debit / credit card purchase and then swap that for NAV at Changelly. The next stage, is to use the Changelly website to swap your Ether for NAV. Use this link and enter how many Eth you will like to convert and it will show you how many NAV you will receive in return, if you are happy then go ahead and click the green “Exchange” Button. 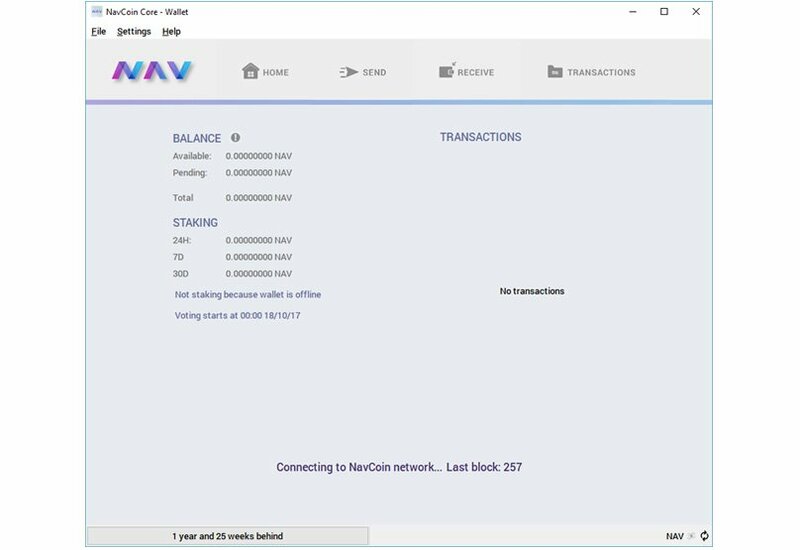 On the next screen, you will be prompted for your Nav Coin wallet address where you will receive the coins. Paste this into the box and click the green “Next” button. Once it’s complete a confirmation message will appear on the screen saying “Transaction Complete”. You can now check your Nav Coin Wallet where you can confirm you now own your NAV. When you download the latest wallet from Nav Coin, you will notice that NAVTech is included and preconfigured. This open-source system is decentralized, allowing anyone to use the Nav Coin server or set up their own. Regardless of the server, NAVTech is the dual blockchain system that allows for private Nav Coin payments. It encrypts the transaction information before sending it through this second blockchain. This ensures there is no link between the addresses involved. How Does Nav Coin Keep Transactions Private? If you opt for a private payment, Nav Coin will send the encrypted private transactions via the dual blockchain, which runs on the NAVTech system. What Projects Has Nav Coin Completed? If you look at the Nav Coin roadmap, you will discover numerous completed projects, including Mobile and Web Wallets, planning for the Anonymous DApps, rebuilding the Subchain, NavTech v1.2, Nav Coin Core 4.0.4, NaviPi 1.0.1, NavTech 1.1, Nav Coin Core 4.0.0, NavPi StakeBox, a website redesign, implementation of decentralization, anonymous merchant integration, a merchant gateway, a thin client on the desktop, the public release of NAVTech, NAVTech Node JS, the NAVTech beta test, Faucet, and Block Explorer. Nav Coin began back in 2014. By 2016, it was the third best performing of all cryptocurrencies. With so many projects under its belt and planned for the future, it can only continue to go up. The developers behind Nav Coin are working hard to expand it with numerous projects. NAVTech Polymorph is in progress. It involves working with Changelly, an instant exchange. This project will provide anonymous payments, as well as the ability to switch between any of the over 25 cryptocurrencies listed on the platform. This project is about 60 percent completed. The marketing roadmap is about 75 percent complete at the moment and will include formalizing a marketing roadmap as well as presenting a marketing plan. Nav Pi 2.0 is 25 percent complete and focuses on streamlining the NavPi interface while improving front-end performance to enhance the user experience. The Community Fund is 20 percent complete, with developers preparing it in case the network vote for it succeeds. The NAVTEch Wallet will combine NavTech, the Subchain, and Nav Coin in one wallet, turning the network into a completely decentralized mesh network. They are also working on Anon Dapps, an Anonymous Decentralized Application platform. The team is also working on Cold Staking Implementation, which will let NAV in cold storage be used for staking input to increase fund security while staking. Developers are also working on a Nav Chain Prototype. Nav Coin takes all the benefits of Bitcoin and adds in privacy via the ability to shield addresses and other information. This lets users take advantage of a cryptocurrency that uses the latest technology and protects their information. Other good points for Nav Coin are the upcoming Polymorph technology, cold staking and the possibility of Smart Contracts and Dapps further down the road and you can see why there are high hopes for the future of Nav Coin, making it a sound investment in the eyes of many.